Gulf stock markets stabilized by the close on Wednesday after plunging in early trade on the prospect of an escalation of Syria’s civil war, as the United States threatened a military strike on Damascus over the use of chemical weapons. Stocks had also tumbled on Tuesday and selling resumed on Wednesday morning as local retail investors, who have dominated trade in recent weeks, scrambled to lock in some of the large gains posted this year. Margin calls caused selling to snowball. But by Wednesday afternoon, the pressure from margin calls had eased and some investors were starting to buy back shares. Dubai’s index, which tumbled 7.0 percent on Tuesday and as much as 7.5 percent on Wednesday morning, ended the day down just 1.3 percent at 2,516 points, after rebounding sharply from near technical support on its 100-day average at 2,342 points. Saudi Arabia, which lost 2.1 percent in early trade, ended 0.4 percent higher. As global oil prices climbed in response to the Syrian tensions, some Saudi petrochemical stocks rose in sympathy. Saudi Kayan jumped 2.6 percent and Saudi Basic Industries (SABIC) gained 1.3 percent. Many analysts and fund managers said the Syrian conflict had merely served as a trigger for a wave of profit-taking that would have happened anyway, given the size of Gulf markets’ gains this year. Dubai is still up 55 percent year-to-date. It is not clear if any escalation in Syria would affect the Gulf significantly, unless it developed into a full-scale military conflict involving Iran, which most analysts believe is extremely unlikely. Middle East tensions actually help the Gulf in one way, by pushing up global oil prices. The fundamental economic picture in the United Arab Emirates and the Gulf Cooperation Council countries in general is “still very attractive”, said Amer Khan, fund manager at Shuaa Asset Management in Dubai. “A lot of things look pretty attractive where they sit right now, such as Abu Dhabi banks that hiked dividends and are looking at growth next year,” he said. Khan added institutional investors had largely stayed out of the recent wave of selling in the region and might now start buying blue chips if they had missed part of this year’s uptrend or wanted to rotate between sectors. Dubai’s trading turnover fell during periods when the market was weak on Wednesday and increased when it was rebounding – a positive technical sign which suggested substantial buying interest remained at the lows. The market now faces technical resistance around 2,600 points, which served as support earlier this month. Egypt’s market fell sharply on Wednesday, a sign that investor optimism after last month’s ouster of President Mohamed Mursi was fading and the country’s severe economic difficulties were again weighing on stocks. 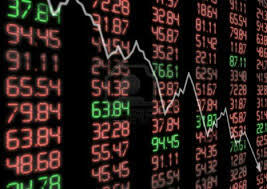 The index dropped 2.1 percent to 5,226 points, its lowest close since July 9. The fall, which started with a gap down at the opening, was technically bearish as it triggered a head and shoulders pattern formed by the peaks since July. The height of the pattern points down to the 5,000-point area. A report in the al-Ahram newspaper, which said Egypt’s interim cabinet was about to approve a plan to stimulate the economy over the next nine months, did not prompt buying of stocks. The plan involves providing additional investments of at least 10 billion Egyptian pounds ($1.4 billion), the newspaper quoted Planning Minister Ashraf al-Arabi as saying. * The index fell 1.3 percent to 2,516 points. * The index dropped 2.2 percent to 3,737 points. * The index fell 0.8 percent to 7,708 points. * The index rose 0.4 percent to 7,751 points. * The index fell 2.3 percent to 9,548 points. * The index sank 2.1 percent to 5,226 points. * The index lost 3.0 percent to 6,641 points. * The index rose 0.3 percent to 1,190 points.